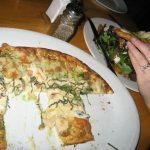 During our trip to Scottsdale, I tried Wildfish (formerly under common management with Roaring Fork) on Sunday night and had an amazing meal for pennies due to their all night happy hour menu. I decided to double down and go to Roaring Fork on Monday (1/16/2012) night for the same happy hour menu concept (though for even cheaper, Roaring Fork is a bit less upscale then Wildfish). This may have been the second best decision of the week. My wife started with the Mixed Market Greens salad with candied walnuts and feta cheese for $6 which was good, though not the Wildfish huge salad portion we had the night before, but very respectable for $6. 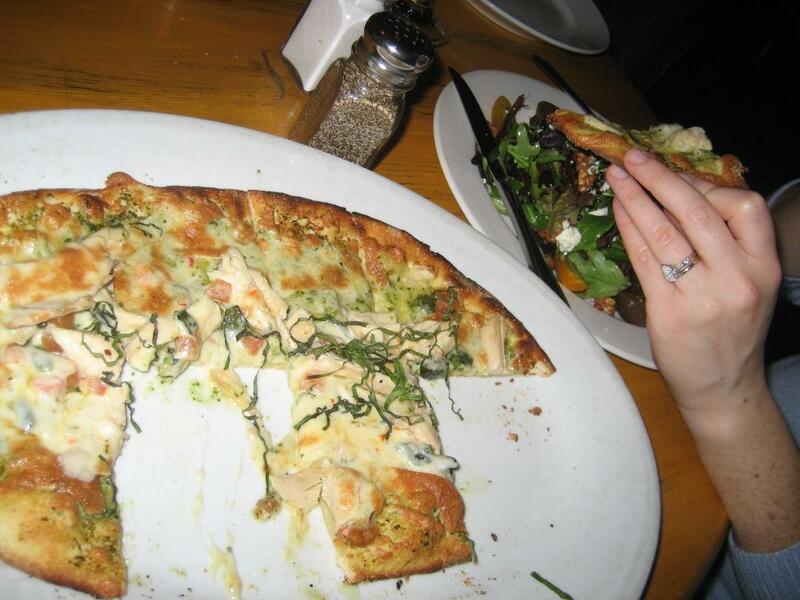 We then had the Rotisserie Chicken Flatbread pizza with basil pesto and roasted chilies for $8. This was very good and of significant size (thin crust an oval 8″ x 5″ if I had to guess). I had 5/8ths of it and was pretty full at that point. We then moved on to the Grilled Fish Tacos with guacamole, corn pico, remoulade and salsa verde for $10. The fish was a good 2oz or more of cooked yellowfin tuna in each of the two large tacos. The only problem was that I missed that it included remoulade sauce (their flavored mayo rearing its ugly head again) on the menu. I scooped it off and still enjoyed the tacos, but it kept my wife away (more for me?). We were planning on trying their small portion of Chili Mac & Cheese (to compare it to Wildfish’s Truffle Mac & Cheese) for $4, but we were just too full. I also tried their $5 Margarita (good), their $5 Barcardi Mojito (terrible, but the server pulled it off the bill without hesitation) and a $5 glass of Kenwood Yalupa Zinfandel (very good). Tonight we really felt like we hit the lottery when the check came — $34.00 + tax & tip for two including 2 drinks. Wow! Read more about our trip to Scottsdale and our vist to their former sister restaurant, the Wildfish Seafood Grill, the prior night. Disclosure: Some years ago, I did business with the owners of Roaring Fork related to their real estate in a different city; however, I retain no incentives to promote the restaurant.